The engagement ring is designed with three flush-set diamonds with a color of G-H and a clarity of VS, with a total weight of .06 carats. It also has four 1.75 mm blue sapphires. Respectively, the band has four flush-set diamonds and four blue sapphires to match. 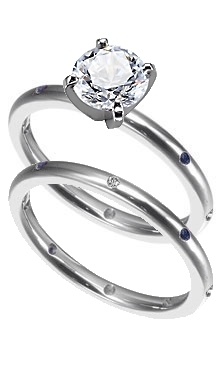 These rings are considered eternity style rings and are unable to be resized or returned.